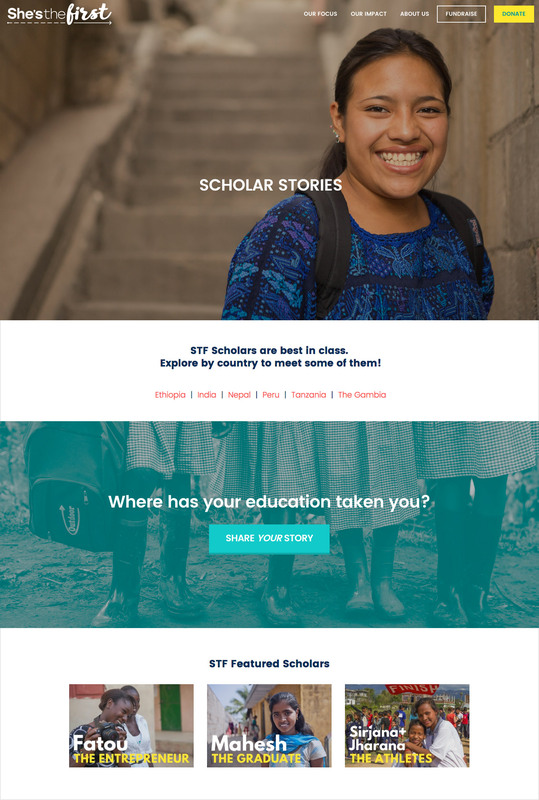 We are proud to announce our newest website launch for She’s the First, an amazing nonprofit that provides scholarships to girls in low-income countries, fosters first-generation graduates and cultivates the next generation of global leaders. 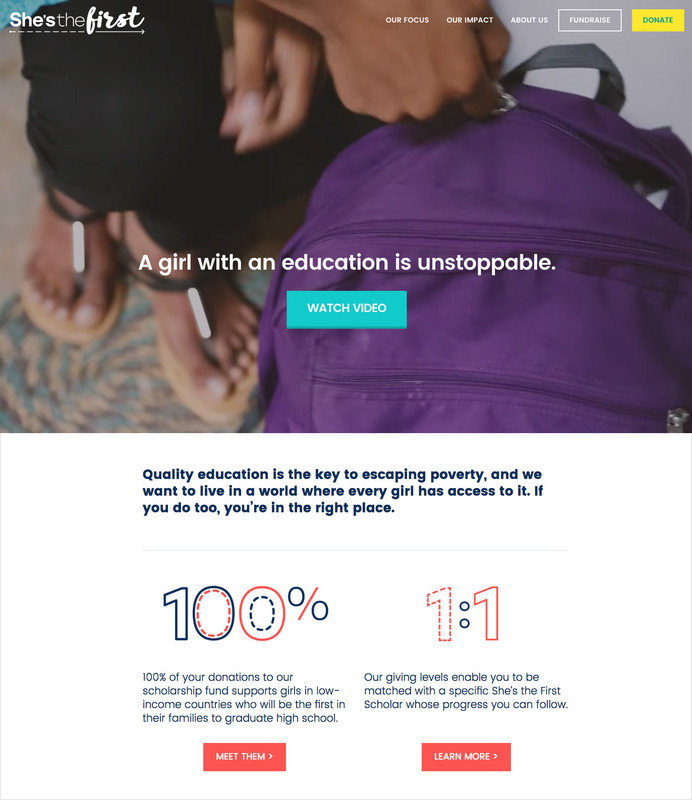 As Marie Forleo pointed out in her recent interview with Tammy Tibbetts, Co-Founder of She’s the First, “when you educate a girl, you change more than just one life. You change the world.” And today She’s the First is doing just that! 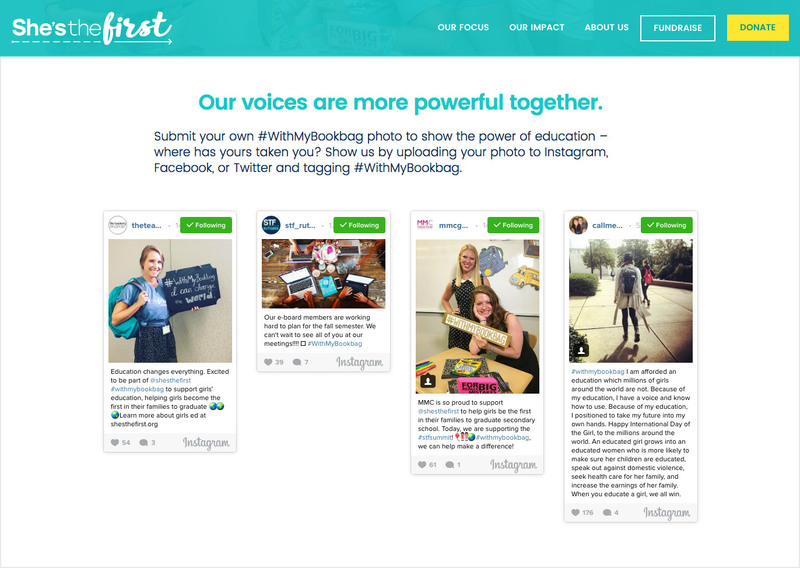 Tammy along with Co-Founder Christen Brandt started out with an idea – to harness the power of social media in the hopes of inspiring and motivating Millennials to support girls’ education. 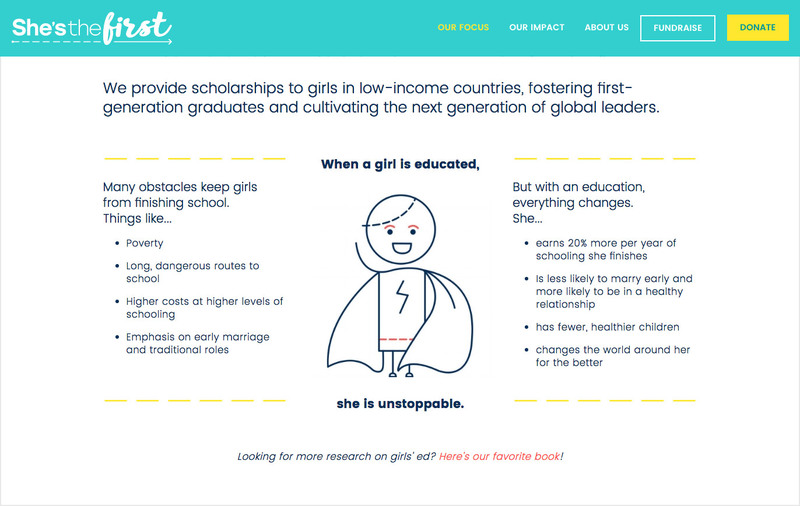 Today, that idea has become a global organization that has sponsored over 1,254 years of girls’ education in low-income countries. As an all women tech and branding firm that is passionate about empowering women and young girls, we were thrilled to work with She’s the First and their incredible team of women. We were happy to integrate the beautiful logo and graphics (created by Genevieve Tabios) and stunning photography (by Kate Lord) in the new site. During our initial discussions of the project, we realized that She’s the First’s legacy website had grown and morphed with the needs of the organization over time – as the organization’s initiatives grew, so did the site. Over time, the user journey became less defined, the site’s content unwieldy and the challenge of effectively reaching different audiences became more and more pronounced. 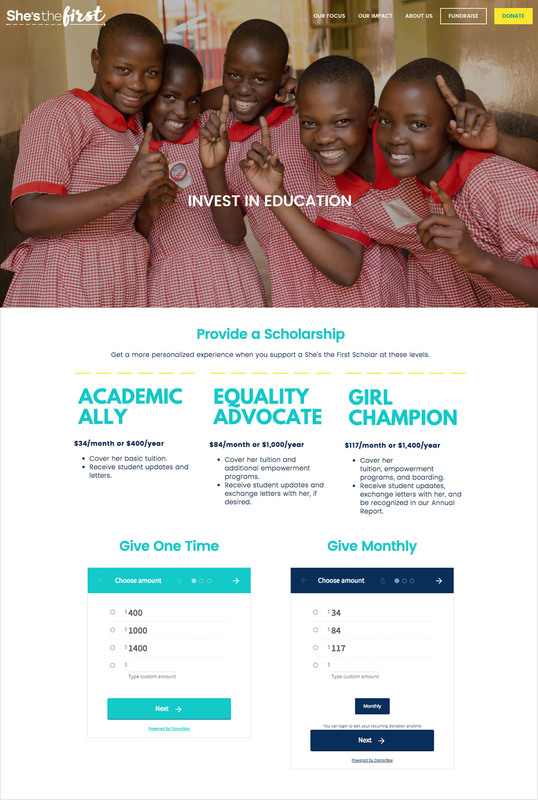 As part of the overhaul the She’s the First team had many goals, such as engaging users to get involved and making the site’s focus, impact and desired actions (such as “donate” and “fundraise”) immediately clear to users. Leading up to design, we worked with the STF team to establish key performance indicators, success metrics, and to flesh out the user journey that would help users take action quickly and find clear pathways to information. As part of this process, we created wireframe prototypes and determined that a custom Squarespace site would be a great fit for their needs. It would allow for a more rapid build and launch and would also take the ongoing updates and security off their plate as this is included in all Squarespace plans. In order to customize the new site to hit the project goals and make an impact on users, we pushed the limitations of Squarespace, integrating several special coded elements to achieve the organization’s unique goals. This includes integrations of an engaging video element on the homepage (with a link to watch the full video in a pop-up) and straightforward donation forms that are easy to use and allow for one-time or recurring payments. We also implemented full Instagram integration, pulling in not just the images themselves, but also captions, likes and comments in order to help tell the story of She’s the First’s work in a visual way. The user journeys are also clear, resulting in a concise, simple navigation that still supports a robust hierarchy of content within the site. Our aim was to push the limitations of Squarespace by integrating several special coded elements in order to achieve the organization’s unique goals. Since launch, She’s the First has seen a significant increase in traffic and donations, with a nearly 100% increase in site visitors within a month of launch. If you’re not sure what the limits of Squarespace are, have found that it’s a struggle to implement what you envision for your web presence on Squarespace, or if you’re a nonprofit that needs help translating a wealth of information into digestible and organized content, we can help. Fill out this form and we can get started!